Our message series “Walk in the Light” continues as we look at the readings from this weekend. This is a fifth and final week of this message series. We are called to be lights in the world and we are looking at different ways in which we are the light of Christ. This weeks message challenges us to be a prophet for God. Four weeks ago we celebrated the feast known as the Epiphany. A celebration of Three Wise Kings following the light of Jesus to his crib, in a stable in Bethlehem. Their presence acknowledging his Kingship, a welcome to the new King they bring royal gifts. We read many places in the gospels about light, Jesus saying, “I have come as light into the world, that whoever believes in me may not remain in darkness” (John 12:46) We are called to be light and to let our light shine. Our message focused on knowing the light has come and challenged us to be ready to walk in the light. Walking in the light does not mean we just let our good work show. Walking in the light let’s all we do show, though we are not perfect. When we fail as disciples we have a God who is mercy and gives strength to our vulnerabilities. Walking in the light requires we actually walk in a new way of life. Three weeks ago we were challenged again to walk in the light and let all we do show. We read how Jesus at his baptism hears the voice of the Father proclaiming, “You are my beloved Son; with you I am well pleased.” This is a message God speaks to each of us as we do the work of spreading his Word and living according to his teaching. We looked at how we are the beloved of God. As the beloved of God we should be willing to walk in the Light. Nothing can attract people more to God than seeing our belovedness shine in the Light. When walking in the Light we are joining in fellowship with one another and with Jesus as the light that leads us all. Two weeks ago we saw Jesus beginning his public ministry and in particular the story of the Wedding at Cana where we heard the words, “Do whatever he tells you.” This is a great mantra for all followers of Jesus, it is advice that will lead to a life of peace and joy. It is being obedient in God, which was our message. We have freedom to choose, we are free to choose good over bad, love over hate, generosity over selfishness, serving others over self-pleasure and devotion to Christ over promotion of self. Choosing to follow the path of Christ is the obedient choice and one that leads to a life of abundance. As we continued in our series theme; “Walk in the Light” we were challenged to live obediently in God. Last week we continued our message series “Walk in the Light” as we looked at how we are fulfilled by God. Jesus declares his mission has begun and God’s plan to fulfill us is put in motion. It begins a time when God will do absolutely everything to bring us freedom and fulfillment. Jesus declares his mission from God, that he is the Son of God, the Messiah and we as a people are to be set free and fulfilled. This is a time when Jesus walks in the light and all is seen, recorded in an orderly fashion and continues to be available to us today so we to understand God’s plan for our fulfillment. This week is our final week of the series “Walk in the Light” and we look at how in so doing we are called to be a prophet of God. A prophet points always toward God, challenges the faithful to live with integrity, challenges them to follow their calling to be Christian and challenges people to a deeper relationship with God. We see in the readings; first, Jeremiah the prophet who stood against the sin of the people and called them to be responsible before God. Secondly, Paul tells us being a prophet without love is like doing nothing. Finally, we see Jesus is a prophet without honor in his own town, and therefore he is not listened to or obeyed. Thus even Jesus the Son of God struggled to be a prophet, so why should we expect any less. The message this week is about being a prophet who walks in the light as we are called to be a light. 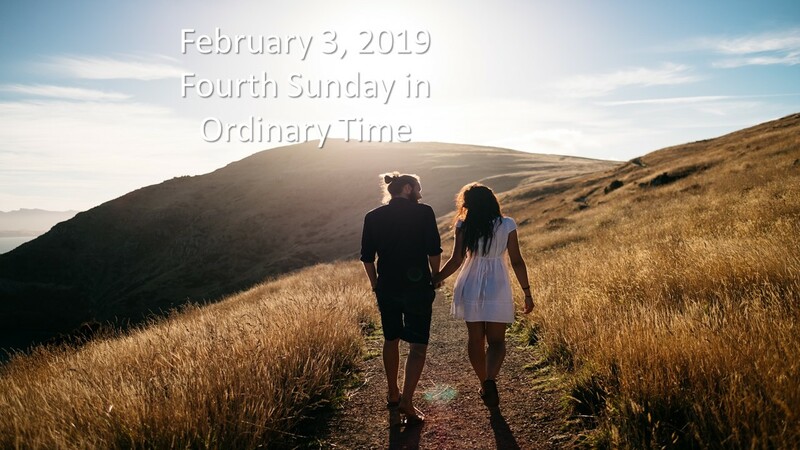 The readings this week are from the Lectionary for the Fourth Sunday in Ordinary Time; Jeremiah 1:4-5, 17-19; Psalms 71:1-2, 3-4, 5-6, 15-17; 1 Corinthians 12:31-13:13 and Luke 4:21-30. These readings guide us this week to look at prophecy and how we are called to be prophets, perhaps not specifically called by God as he called the prophets of old but we should stand like the prophets of old to call followers of Jesus to repent and be responsible followers of God. Jeremiah hesitated to become a prophet when called by God. Eventually he capitulated and became one of the most decisive prophets in history. Jeremiah was known by God even before he was born, God formed him in his mother’s womb. God sanctified Jeremiah before he was born. Jeremiah was set apart for the Lord’s work before he knew the Lord in a personal way. As a prophet he was chosen and a spokesman for God, he announced God’s Word. More than being fore-tellers of the future prophets expose the sins of the people calling them back to their covenant responsibilities before God. God goes on to tell Jeremiah he will protect him and although he will stand alone in telling the people their sins God will always be with him. Jeremiah was one of the most unpopular prophets in the history of the chosen people and measured by human standards his ministry would be a complete failure. He had to stand alone, resisting the crowds. In God’s measurement he was a great success, and he stood with God challenging the people and leaders for over forty years. As a prophet Jeremiah did not have a ministry that was applauded, but rather he constantly had to speak truth which was the opposite of the choices being made by the people. In life he was a prophet who honored God. In the second reading from First Corinthians we read Paul’s great writing on love. But he starts off looking at gifts, indicating some spiritual gifts are greater in significance than others and it is proper for us to desire these gifts. Paul puts high value on the gift of prophecy while the Corinthian community valued the gift of tongues. Paul goes on to name five gifts; tongues, prophecy, knowledge, faith and giving (sacrifice). He highlights without love these gifts are nothing. Paul insist we must love, that love enriches all it touches. Love gives moral instruction; patience, kindness; is not jealous, is not rude, is not self-seeking, is not quick tempered, does not brood over injury, does not rejoice over wrongdoing, it rejoices in truth, bears all things, believes all things, hopes all things and endures all things. Paul is writing this to the community because he recognized they are not following love, they rather brag about their gifts. In order to be a disciple, a prophet for God, we must have love. Gifts will fail and cease but love will always endure. We are challenged to grow and mature which means discovering love is crucial and living in love is critical to the success of any Christian using their gifts. We are looking at being a prophet for God, which is an important gift according to Paul, but if we don’t love, our prophecy can mean nothing. If we speak truth, and challenge sinfulness of others like the prophet Jeremiah, but do it without love our ministry comes to nothing. In the gospel reading from Luke we read of Jesus speaking about being a prophet in his native land and saying, “Amen, I say to you, no prophet is accepted in his native place.” Then he goes on to speak about Elijah and Elisha two prophets who did very little in their own land during certain periods. In the end the people who were Jesus’ town folks, who wanted to see miracles, wanted to see healings, where so angry with Jesus they went to throw him off a hill, headlong. But it was not Jesus time and he slips through their midst. These were people who knew Jesus, they knew his family, they knew the work of his father and yet when he could not do what they wanted, despite their hearing he performed miracles in other places, they were furious. We see Jesus as a prophet in the incident and we see it is the call of the prophet to reveal to people their own selfish desires, to challenge them to look outside themselves. It is unlikely in this incident these people reflected and decided to change but certainly their anger would cause them to think and wonder why. Today’s prophet risks their own comfort to say to others, it is not about you. Today’s prophet challenges followers of Jesus to remind them what his mission is in the world today. Today’s prophet does not go along, does not blend in, does not embrace the structure of power the world models for us, does not seek to be number one at the demise of all others, today’s prophet offers their lives so others will know they are loved. To be that prophet will be hard, you will not be honored in your own home, and you must do it with love or you are accomplishing nothing. Many prophets must be raise up to speak to the followers of Jesus, prophets point to Jesus and say Jesus is better for your life, your life will be better with Jesus. Today, more than ever we need new prophets. Walking in the Light as a prophet will show others that there is suffering and sacrifice in a life in Christ. But like Jesus, the prophet uses this suffering and sacrifice so others will know joy. As a prophet of God from now until we see God face to face we will proclaim the wondrous deeds of our God. We proclaim God and let our light shine as we walk in the Light. When we study scripture we hear John the Baptist was the last prophet. We also have Jesus the Son of God who comes and reveals the Father to us, he reveals his own core principle to do the will of the one who sent him, he teaches us to love God, love others and to make disciples. When we study scripture we come to know all prophecy has been revealed. All that we need to know is known, thanks to Jesus. But, we still need prophets like Jeremiah. Today’s prophet doesn’t need God to call them and reveal their mission and prophecy. We have the message of Jesus so we need prophets today to stand in front of others, proclaiming and living the message of Jesus. Today’s prophets need to challenge those who think doing a little for Jesus is enough. We need prophets today to challenge the culture, to challenge those who are Christian in name only. It is not enough to worship an hour each week and return to a life that is no different from the life of your neighbor who does not follow Jesus. Following Jesus means we are different and people can tell when they see us. To be Christian means our works define us, how we treat the sick defines us, how we honor women defines us, how we honor children defines us, how we reach out to those in need defines us, how we help the disabled defines us, how we feed the hungry defines us, how we help the poor defines us, how we treat those in prison defines us, how we treat the stranger defines us. Sometimes we Christians can get focused on what we need to do to make our own life joyful and sometimes forget our role as a Christian. Christians can think doing no harm is good. They need to be reminded not doing good is not good. It is why we need prophets to stand up today and remind us what it means to be a Chrsitian today. A prophet today knows God, spends time with God and is familiar with God’s Word. Today’s prophet has the courage to challenge other Christians. A prophet today is bigger than their own needs. A prophet today stands with God, bringing the Word of God to all who have declared they are followers of Jesus but aren’t living it. Today’s prophet reminds the Christian what it means to be a Christian. A prophet today loves and challenges with love. A prophet today does not let a Christian forget the message of their Master, a message that all Christians should live fully and spread. Today’s prophet is like Jeremiah, taking the Word of God and bringing it to God’s people, reminding them of the promise they made becoming Christian. Today’s prophet is a steward of the church and of faith. Today’s prophet challenges others to use their stewardship to not take, but to give, to engage others and help the church grow. Today’s prophet helps spread the message of Jesus and stands lovingly with others so they can live this stewardship as well. There was a time when followers of Jesus were a small band of radicals with an impossible message shouting at a Goliath who only care about itself. A message that said it is better to give than receive. A message that said slavery is not okay. A message that said killing is not okay. It is a message that objects to the idea that might means right. It is a message that all people are equal. A message that said even enemies should be treated humanely. That message took over the world, what seemed impossible happened. We need prophets today who will walk in the light and push the message of Jesus again, more firmly and with love. It is not okay to just go along, to blend in, and to live for ourselves. We need prophets who will ensure the church, the message of Jesus, continues to shape the conscious of our communities, our nation and the world. We need prophets who stand on the shoulders of all those prophets who came before them and stood against all odds and did change the world. We need prophets who love as Jesus loved. We need prophets who will engage with others and challenge them to be prophets too. Jesus needs you to be a modern prophet. We are challenged to submit to God’s love, giving our lives and doing so walking in the light. We are challenged to be a prophet of God. We can be a prophet who remains in God’s presence, finding peace, having forgiveness, purpose and discovering how deeply we are loved. We must let others see God working in our lives and we must offer ourselves as a prophet pleasing and holy to God. When we walk in the light, and we accept that light shining on us, glorifying God, sacrificing our lives for God, we are submitting to Christ and doing what his love requires of us. Through our fives messages in the message series “Walk in the Light” we have looked at letting our light shine consistently so others see the Light has come, that they are the beloved of God, through obedience they glorify God, they are fulfilled in God’s promise and they must be a prophet today to engage others to work in the church. Walking in the light means we seek to be instruments of Gods conversion, that we actively seek God’s will and then obey it. Walking in the light of Christ allows us to form the conscious of those whose lives we engage.